Our country house is located in the drove road Vereda de la Porrada, an old transhumance path used by herders and where, still today, flocks of sheeps graze in the field. The path leads through the Sierra Morena Trail – GR 48, within the municipal district of Almodóvar del Río. Almodóvar is a charming Andalusian village of about 8,000 inhabitants. The Roman Bética Route passes through the town and among its many attractions stands out its Castle of La Floresta; an imposing fortress of Muslim origin and one of the best-preserved castles in Spain that offers outstanding views over the countryside and the Guadalquivir Valley. La Floresta became part of the series Game of Thrones filming locations as Highgarden, the ancestral home of House Tyrell. The Reserve of Sierra Morena is the largest Starlight destination in the world, certified by the homonymous foundation and backed by UNESCO. With more than 60% of clear night skies and minimal light pollution, you will be able to observe all the constellations and watch the celestial spectacle: the Perseids meteor shower also called “tears of St. Lawrence’”. The house is surrounded by gardens with native vegetation and aromatic plants that will be a pleasure for your senses. La Garrida is located only five minutes’ walk from La Breña Reservoir, one of the largest in Andalusia, where you can wakeboard or waterski. A Countryside Activity Centre is located alongside the Reservoir whose supplementary offer is as varied as taking a solar-powered boat trip, Kayak hiring, paddleboarding, archery or zip-line riding and even scaling a climbing wall. 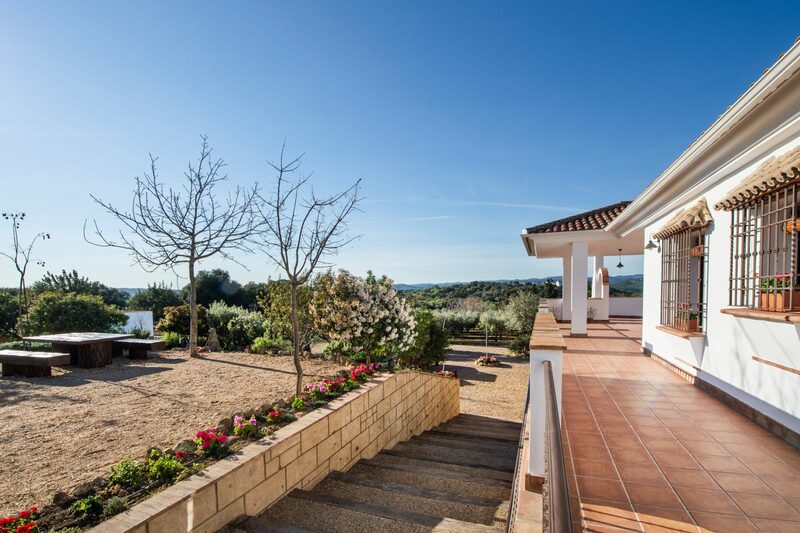 The country house La Garrida is located at the foot of the Natural Park of Hornachuelos, its Mediterranean forests and riverbanks are among the best- preserved areas of Sierra Morena. Its trails will transport you to places full of charm where you can watch the flight of birds like storks, eagles or vultures as well as otters, mongooses, wild boars, deer and even Iberian Lynx. Do not forget to taste the Serrano delicacies such as cold or game meats, after your hiking route. The city of Córdoba is an absolute must-see located at 22 kilometers. Is one of the most recognized cultural destinations in the world, boasting four declared UNESCO World Heritage Sites: the Mosque-Cathedral (1984), The Old Town (1994), The Courtyards Festival (2012) and the just declared Caliphate City of Medina Azahara (2018). The Mosque-Cathedral is without a doubt, Córdoba’s crown jewel. It is the only cathedral in the world that was built inside an old Mosque; a stunning monument that will both surprise and impress you and will forever be engraved on your memory.